Located in the southwest suburbs of Minneapolis, Eastern Carver County Schools encompasses 13 different locations and 9,600 students. Since student records must be kept either for five years after graduation or forever, student files used to take up a lot of cabinet space. Here is how the district integrated Laserfiche with its Infinite Campus student information system (SIS) to make student records completely electronic. Each student has a cumulative folder that contains all the records accumulated during their tenure at the district, such as transcripts and proofs of immunization. These cumulative folders are now digital and stored in the Laserfiche repository. 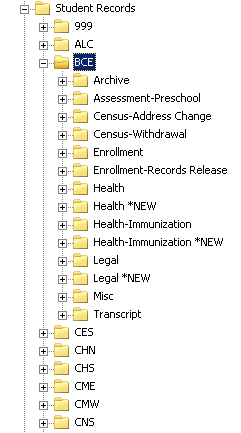 The repository is structured in such a way that under the main “Student Records” folder, there is a separate folder corresponding to each school. The school folders are named with a three-letter Infinite Campus School ID. Within each school’s folder is a separate folder for every document type. Within each document type folder are all the student records for that particular school. Records for students who haven’t yet been assigned to a specific school are located in the “999” folder. Security is configured in such a way that staff members at a particular school can see only the student records in the school which they work. Student records are scanned in as soon as they are received by either a person in the District Welcome Center, Registrar’s office or at one of the school sites. The person who scans the records appends the Student General template and populates the student ID and document type fields. A Laserfiche workflow performs a lookup in the Infinite Campus database by student ID and populates the remaining metadata such as student name, current school and contact information. This workflow also renames the document to comply with the standard naming convention and moves it into the proper folder in Laserfiche. 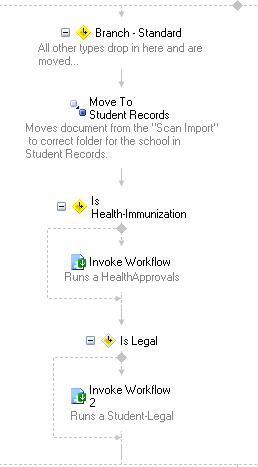 If the document is a health record (such as an immunization document), the HealthApprovals workflow is invoked. This workflow notifies the school nurse about the new health-related document. The nurse must then review, take appropriate actions based on the information and then marks the document as approved. If the document is a legal document, the Student-Legal workflow is invoked. This workflow notifies the legal/registration department who then takes appropriate actions based on the information and then marks the document as approved. Students who are new to the district must first come to the Welcome Center. At the Welcome Center, the student and his parents submit all the required paperwork, which is scanned into Laserfiche onsite through Laserfiche Web Scanning. Laserfiche Workflow automatically populates the metadata from Infinite Campus and moves the files to the appropriate location in Laserfiche. In this way school administrators have access to the student’s records before the student even starts school. Laserfiche Workflow also ensures the student records stored in Laserfiche are always up to date. Every night, a workflow looks through all the student cumulative files in Laserfiche and, using a lookup into Infinite Campus, makes sure the metadata is correct. If the metadata doesn’t match, it is updated in Laserfiche. If the workflow finds that the school has been changed (for example if a student switched schools because he graduated), it moves the student’s entire cumulative file to the new school site. 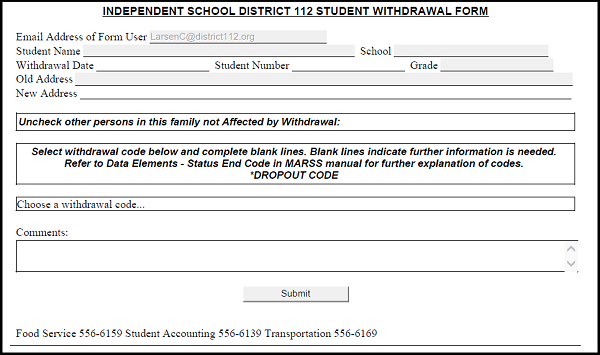 If a student is withdrawing from the district or changing his address, staff in the schools fills out a custom electronic form on the district’s website. Once the form is submitted it is saved as a PDF on the server. From there, Laserfiche Import Agent imports it into Laserfiche. 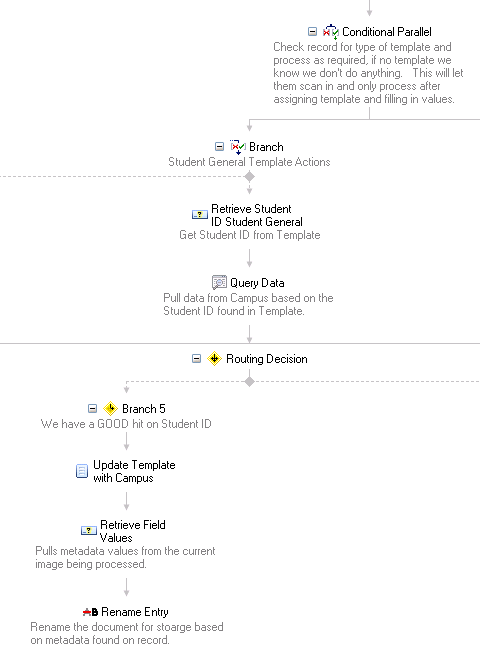 Laserfiche Workflow picks up the document and fills in the remaining metadata based on the student ID. Workflow them moves the document into the appropriate Digital Cumulative folder in Laserfiche. Another workflow notifies both the transportation and registration departments that the person has withdrawn or moved. Managing student records with Laserfiche has resulted in the following benefits for Eastern Carver County Schools. Student files no longer need to be physically moved whenever a student changes schools or graduates. Eastern Carver County Schools ensures compliance with the Minnesota State Student Enrollment mandates. Student records are secure because district employees only have access to records which they are authorized to see. Schools no longer have to send documents to each other by mail. If a parent delivers a student record to a different school (for example drops off the proof of immunization for both of her children at her youngest child’s school), the record can be scanned on site and immediately moved to the appropriate school location within Laserfiche. 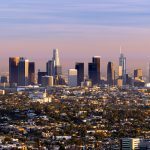 If the student moves or withdraws from the district actions can be immediately be taken to ensure the affected schools and departments are aware of the changes.